THIS 19 year-old Japanese Man Survived The Atomic Bomb In Hiroshima And Won The 1951 Boston Marathon! Shigeki Tanaka, born April 7, 1931 was only 13 years old at the time of the 1945 Hiroshima atomic bombing. In high school he laid the groundwork for his career as a marathon runner by running 20 km from Shōbara to a Saijō municipal stadium. Japanese athletes were barred from all major international competitions after World War II, including the 1948 Summer Olympics in London. 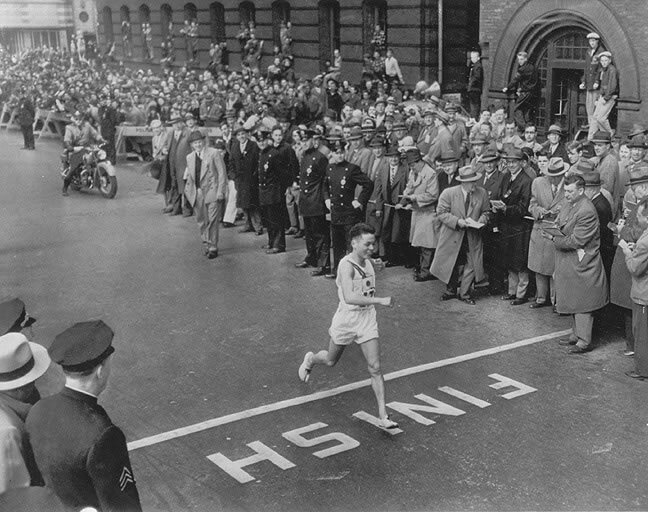 The 1951 Boston Marathon was the first post-World War II athletic competition to invite Japanese athletes. Tanaka was one of four Japanese runners invited to compete by Will Cloney of the Boston Athletic Association. He recalls that people in the United States welcomed them warmly. He says that both Japanese and Americans cheered him during the race. However, nobody expected him to actually win the marathon. He was 19 years old, and weighed 118 pounds. The Boston Globe nicknamed him “atomic boy”, which he found “a burden”. The crowd was silent as he crossed the finished line. His win was a landmark moment in restoring the war-shattered country’s dignity and honor following World War II. The race and Tanaka’s victory marked the beginning of a strong athletic relationship between Japan and Boston, and the beginning of a tradition of Japanese victories in the race. Despite his backstory, Shigeki Tanaka won a marathon and he did it with a spectacular time. Even more, he won in an environment far away from his home where nobody believed in him. He proved that sport is bigger than war and hate, showing the world that if you choose to be great it doesn’t really matter who cheers for you.